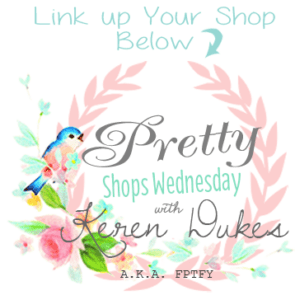 Welcome to the First Pretty Wednesday Link Party! For those of you that are new to my Blog, Linky Parties aren’t something new around these parts.. WYWW had a strong 124 weeks, and as most of you know, it was one of the very few linky parties out there that allowed SHOPS to link up. I never wanted that option to go away, for I know, many of you truly appreciate it! I mean.. who doesn’t like Free advertizing, right? So why the change? The main reason is, WYWW was just really all over the place/disorganized and that definitely needed to change. « Free Digital Scrapbooking Fabric Covered Buttons no. 2 CU ok! Thanks for joining us once more sweet one! xo! THANK YOU!! :) Your comment made my night!! Welcome Katie! Thanks for joining the fun! Thank you for continuing the party and I think it is fantastic with the sections clearly divided! Well this party is amazingly gorgeous!!! LOVE IT!!!!! You are so kind and generous to allow us to list our Etsy Shops…that is so awesome!!!!!!!!!!!!!!!!!!!!!! : ) hugs my friend…we all love you! Oh this is way better. I like the new format a lot. I was starting to get scared that you may be canceling posting from shops, etc. Yay! So cool. Love the new link party Keren! Thanks so much for hosting another beautiful, fun event! I like how you separated the linky parties with blogs and shops. Makes it easier to look at things. Great idea dividing the links up Keren! Your blog is going gangbusters!! !